Right now over at Amazon you can score this Amazon Fire TV Stick with Alexa Voice Remote PLUS the Echo Dot for just $59.99 shipped (regularly $90)! The Fire TV Stick is controlled with an Alexa Voice Remote and allows you to stream over 7,000 apps, games, Netflix, Hulu, HBO NOW, WatchESPN, Disney, and more (subscription fees may apply). 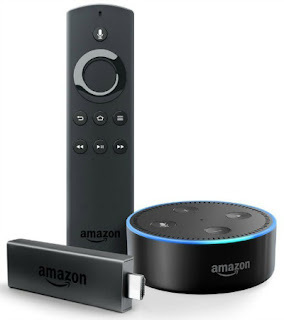 The Echo Dot is a hands-free, voice-controlled device that can pair with the Fire Stick to gain control of your TV. You can also control smart home devices, make calls, send messages, read audiobooks, and more.